It turned out that the weather report was depressingly correct again, and rain was coming soon. I was feeling some pressure because I needed to locate a Notary Public in town, and I wanted to get that job done before the rain came in. Around 8:30 I was finally able to find a law office in town where a notary was available, and so I zipped out while the other guys were still packing. I got my documents signed and notarized, dropped them in a FedEx box, and finally was free of that business obligation. So, back to motorcycling. Now here’s the other part about working from the road. You can’t really enjoy the travel if you mentally carry around your work worries with you. I’ve had a lot of practice at this, so believe me when I say that one minute after I dropped the package in the FedEx box, I was thinking about nothing but our day of adventure ahead. Compartmentalizing your work is a skill that full-time travelers must learn, if they are to have any fun at all. It wasn’t yet raining as I went back to the motel, but the toes of my boots got soaked anyway from the puddles on the ground left by overnight showers. So another lesson learned: wear the overboots whenever the road is wet. Or, as I’ve decided to do, invest in a good pair of motorcycle boots that are waterproof. Our route for the day was completely undetermined. Steve hadn’t done much research on travels in the US. He kind of regarded the trip as being more or less over with by the time we left Quebec. But we had at least three days of travel remaining before we landed back in Vermont, and we needed to plan some sort of interesting route, or we’d just end up on the paved highways covering miles for the sake of covering miles. 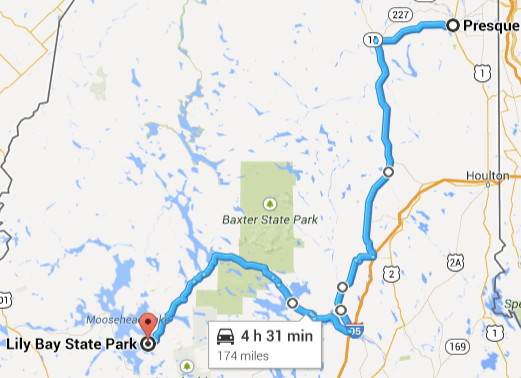 We did some checking and were disappointed to find that virtually all of northern Maine is closed to motorcycles. The roads up in the forests are all privately owned, by land conservation groups, paper and timber companies, and various others. So the roads are all private too, and they are not exactly speedways. This was a major blow: the most exciting roads were off-limits. At first our route was just pavement, so it didn’t matter. And it was raining again, so we weren’t eager to hit slippery dirt yet anyway. Even at our lunch stop, the rain continued. But by the time we got to East Millinocket, things had cleared up and the lure of dirt riding was too much for Steve. If I had remembered my pledge to go wherever he led us, Eric and I might have allegedly possibly could have followed him along a 50 mile ride of hell. Let’s just say that there are very good reasons why motorcycles are not allowed on certain roads. There is no street bike or hog that could ride the road we theoretically might have ridden. Harley riders, don’t take that as a challenge, it’s just a fact that might save your bike. Imagine water crossings with two-foot deep ditches, potholes with potholes in them, and sections so riddled with bone-jarring bumps that it would be more comfortable to just ride a mechanical bull in a 1980s romantic comedy. Remember my sore shoulder? If we had ridden that road—and I’m not saying we did—it would have been the least sore part of my entire body. We ended our day in a nice state park called Lily Bay, near Moosehead Lake, ME. The sites were wooded and lovely, the rangers were super friendly, and so were the mosquitoes. You’re not supposed to feed the wildlife, but in this case, it’s hard to avoid without 100% DEET on your body. I slapped one mosquito flat while we were checking in at the gate and without looking up the ranger said, “Thank you.” One down, 75 billion to go. This was again the sort of place where we immediately slathered ourselves with DEET before we did anything else. Fortunately, it worked. We set up camp and set out for the town of Moosehead Lake (maybe 10 miles away) for dinner. A light rain shower started again on our way to town, so we stopped and threw on the rainsuits again, but after dinner things cleared up to give us a nice evening ride back to the campsite. Or so I thought. Along the way back Steve took a detour up yet another dirt road, which turned out to be not much more than a road, but then he zigged again and found something really challenging. I was in the third position, and feeling pretty tired. I didn’t want to go down these roads so late in the day, and within just a few hundred feet the road got so technical that I was beginning to worry about crashing again. But I couldn’t raise the other guys on the intercom because their batteries had run out, and I couldn’t catch up to them. So after the second or third near-crash in a puddle or while avoiding a massive rock or fallen log, I just stopped. Little did any of us know that the crash site was not 0.3 miles from the paved road, but rather 0.3 miles from a dirt ATV trail off the paved road. That dirt trail wound into the woods for literally miles, forking into separate trails periodically, and seemingly without end. Once every mile or so we’d see another “B-52” sign but no other indications of how much further it might be. This wasn’t what I was expecting and I wanted to turn back, but I was so tired that even catching up to the other guys on this potholed loose gravel road was too much of a challenge for me. So I followed, hoping eventually we’d find the B-52. We never did find that crash site, but I made one of my own. At one of the forks Steve stopped for a conference, and I said, “Forget it, I want to go back.” The other guys were agreeable to that. The fork in the trail formed a nice triangle that made for an easy turn-around, but right then my brain just suddenly forgot how to ride a motorcycle and instead of staying on the road I just helplessly watched as the motorcycle, seemingly under its own control, went off the road, across a ditch, and crashed gently into a stand of saplings. I was on the bike and theoretically the operator, but for those few moments I could not remember even how to apply the brake. Fortunately, the crash was soft and the bike jammed between a few trees so it was left standing upright. I was so disgusted and upset that I just got off the bike and stomped off while Steve and Eric retrieved it. I yelled to Steve, “I’m just too tired to keep riding!” and he said, “I can see that now. We’re going back.” It was 7:30 pm. The crash did no damage other than to break the other front turn signal. Eric made me feel better when he said, “That’s OK, they are supposed to be replaced in pairs anyway,” which is a mechanic joke. The nice thing about riding with these guys was that when I did have an incident they just jumped in and helped, and didn’t make me feel worse about it. But I did feel pretty awful and I was exhausted. Plus, the score was now embarrassingly lopsided, Rich 4, Steve 2, Eric 0. The campground bathrooms at Lily Bay are not close to the camp sites. We had a pit toilet nearby, but for actual running water I had to hop on the bike one last time that evening around 7:45 pm and ride 1.2 miles to the shower house. You can believe that I was extremely careful for that last ride. I had pushed beyond my personal limits on this day, with about 200 miles of riding spread over 12 hours, at least 50 of which was tough dirt (theoretically), and the last thing I wanted was to crash again somewhere in the campground in the final mile. I survived this final ride, said goodnight to the mosquitoes, and retired to my tent.